SHANGHAI--(BUSINESS WIRE)--Today, Starbucks Corporation (NASDAQ: SBUX) presented the company’s key drivers that will fuel China’s market growth over the next five years at its first-ever China Investor Conference. 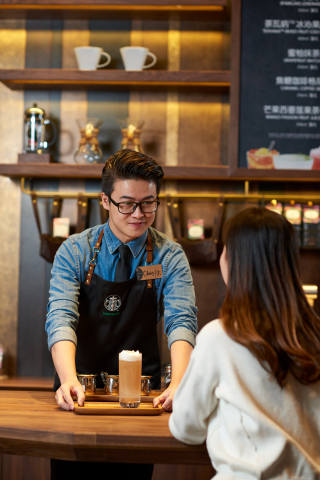 Through the company’s purpose-driven growth agenda in China, Starbucks is focused on enhancing its immersive, coffee-forward approach to elevating the third place, building deeper customer relationships in digital and extending the Starbucks Experience to the on-the-go and at-home consumers. Supported by these initiatives, the company announced plans to build 600 net new stores annually over the next five years in Mainland China – a goal that will double the market’s store count from the end of FY2017 to 6,000 across 230 cities. The company also announced plans to more than triple revenue and more than double operating income in China by the end of FY2022, relative to FY2017 levels. Today, Starbucks operates approximately 3,300 stores in 141 cities in China and employs 45,000 partners (employees). 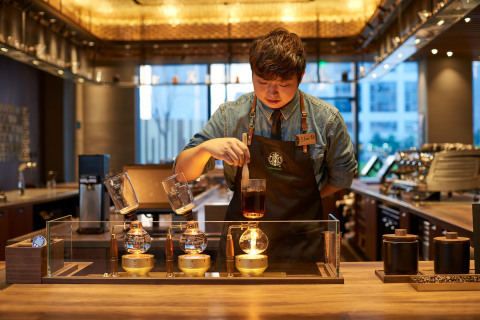 With a new store opening every 15 hours, Starbucks China’s steadfast commitment to disciplined growth, from real estate selection to partner training and operational excellence, has resulted in a store portfolio that has some of the company’s most innovative, efficient and profitable stores. Starbucks newest class of stores in China are delivering the highest average unit volumes, return on investment and profitability of any of the market’s prior store classes in its history – a clear demonstration that customers in China continue to embrace the Starbucks brand. Starbucks has created a brand roadmap to deepen coffee knowledge and human connection – creating a Starbucks Discovery Journey that manifests itself into a unique store development process and respect for local heritage specific to China. This journey starts with locally curated core store experiences. In 2014, Starbucks built its first Starbucks ReserveTM Bar to deepen customer coffee engagement and provide immersive experiences. With more than 150 locations currently, the company plans to reach 200 ReserveTM Bar stores by the end of FY2018. 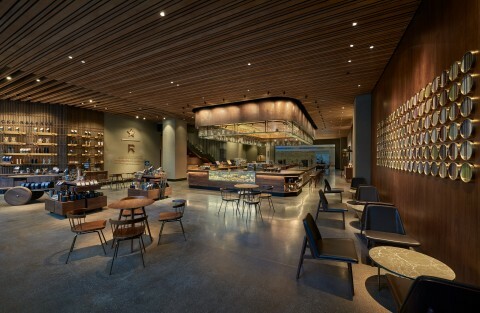 Since opening the Starbucks ReserveTM Roastery in Shanghai nearly six months ago, it has become recognized as a highly dynamic and immersive coffee-forward retail experience, delivering premiumization to the coffee category and fueling the next wave of transformation that is elevating the Starbucks Experience in China. Next month, the company will open its newest multi-level flagship format – the Beijing Fun flagship store. Located inside the high-traffic Beijing Fun shopping area, this will be the largest store globally, aside from the Roasteries. It will deliver the immersive experience found at the Roasteries through three distinct craft bar experiences: Starbucks ReserveTM coffees, TeavanaTM teas, and mixology. Starbucks digital flywheel in China is the foundation that will help elevate the experience in stores and drive customer loyalty. It will enable the company to unlock many new features, such as personalization, Mobile Order and Pay (MOP) and delivery service. With the number of active past 90-day loyalty members nearly tripling over the past four years to almost 7 million, and 90 percent of members actively engaging via the Starbucks app, Starbucks China offers the most innovative mobile ecosystem of the Starbucks portfolio globally. 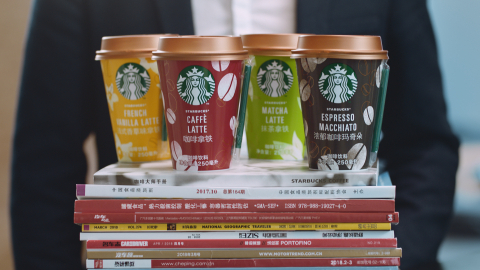 Having pioneered “Say it with Starbucks,” a social gifting feature on WeChat less than 18 months ago, Starbucks today, announced “Say it with Starbucks” is now also available on the Alibaba platform, solidifying its leadership position as an experiential brand in China. Building on the first augmented reality experience at the Shanghai Roastery, Starbucks tested this technology in its core stores this past February during Chinese New Year. The company sees great opportunities to enhance the partner and customer connection through this digital feature. Among Starbucks global portfolio, China is leading in terms of digital payment, with greater than 60-percent digital tender mix, and 80-percent cashless, greatly improving the partner and customer experience alike. Over the next five years, the Starbucks Ready-to-Drink (RTD) business in China is expected to expand to more than 400 major Chinese cities across more than 125,000 premium points of distribution in partnership with Tingyi, a leader in China’s RTD beverage category. On June 12, the company will introduce the Starbucks® chilled cup platform with four flavors, introducing a new Starbucks category to the Chinese consumer. This beverage platform is expected to quickly become a preferred on-the-go format for coffee and tea in China. The chilled cup platform builds on the success of Starbucks DoubleshotTM RTD beverages which were introduced last month. In addition, Starbucks will look to leverage the recently announced global coffee alliance with Nestlé to provide even more at-home options to the Chinese consumer in the future. 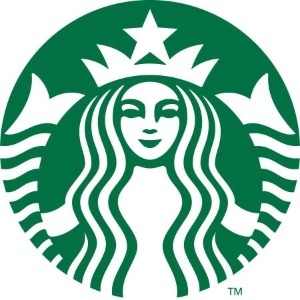 The alliance will enable Starbucks Channel Development to grow its reach and scale in the single-serve and foodservice businesses, leveraging Nestlé's reach to expand Starbucks Consumer Packaged Goods (CPG) presence from 28 countries to nearly 190 countries around the world. The alliance will also bring Starbucks Coffee to both the Nespresso and Nescafé Dolce Gusto machine platforms around the world. 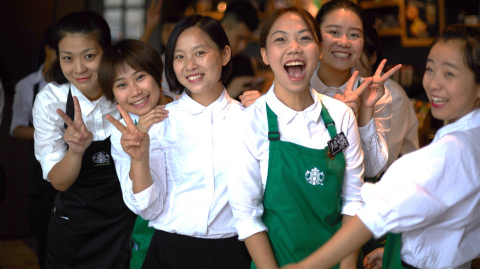 Starbucks purpose-driven growth agenda in China is rooted in the belief that a company must do well to do good to make a bigger impact in the community. Core to this agenda is the company’s focus on its partners and social impact. Continuing to elevate the partner experience is foundational to driving long-term growth in China. The company holistically invests in benefits that are locally-relevant. This includes Bean Stock and comprehensive health insurance for all eligible Starbucks China partners and their families. In addition, Starbucks China partners receive housing allowance subsidies to help young retail partners overcome their financial challenges of living outside their hometowns. The importance of family values in Chinese culture is also embedded in the benefits eligible Starbucks China partners receive, as evidenced by the pioneering of critical illness coverage for more than 14,000 parents of Chinese partners. Collectively, these actions continue to yield results for the company with significantly lower partner turnover relative to industry benchmarks as well as increased labor productivity experienced over the past five years. Starbucks is committed to using its scale and success to give back to communities as the company continues to grow in China. Undertaking a series of commitments, The Starbucks Foundation and Starbucks China are contributing meaningful and enduring social impact through poverty alleviation by creating opportunities for groups facing barriers, strengthening partner-driven and locally relevant community engagement, and improving the lives of Yunnan coffee farmers and their families through a $20 million USD (RMB 132 million) five-year commitment. The event webcast, including closed captioning, can be accessed on the company’s website: http://investor.starbucks.com. A replay of the webcast and slides shown during the presentations will be available on the company’s website. The webcast will remain available for replay through June 15, 2018. Certain statements contained herein are “forward-looking statements” within the meaning of the applicable securities laws and regulations. Generally, these statements can be identified by the use of words such as “anticipate,” “expect,” “believe,” “could,” “estimate,” “feel,” “forecast,” “intend,” “may,” “plan,” “potential,” “project,” “should,” “will,” “would,” and similar expressions intended to identify forward-looking statements, although not all forward-looking statements contain these identifying words. These statements are based upon information available to Starbucks as of the date hereof, and Starbucks actual results or performance could different materially from those stated or implied due to risks and uncertainties associated with its business. These risks and uncertainties include, but are not limited to, fluctuations in U.S. and international economies and currencies, our ability to preserve, grow and leverage our brands, potential negative effects of incidents involving food or beverage-borne illnesses, tampering, adulteration, contamination or mislabeling, potential negative effects of material breaches of our information technology systems to the extent we experience a material breach, material failures of our information technology systems, costs associated with, and the successful execution of, the company’s initiatives and plans, the acceptance of the company’s products by our customers, the impact of competition, coffee, dairy and other raw materials prices and availability, the effect of legal proceedings, and other risks detailed in the company filings with the Securities and Exchange Commission, including the “Risk Factors” section of the Starbucks Annual Report on Form 10-K for the fiscal year ended October 1, 2017. The company assumes no obligation to update any of these forward-looking statements.